Three years ago to this day, we walked out of our wedding ceremony to the cheers of the congregation, rings on our fingers, Nat King Cole’s L.O.V.E dancing in our ears and joy in our hearts. I married you because you make me a better, happier, more confident me, for your easy charm and endless capacity to love. I thought our wedding was the happiest day of my life until we found out that Nino was on the way, then came the day that he was born, then every single one since: that happiness dial keeps tipping as our family expands. That’s not to say these last three years haven’t been testing at times. You lost your Dad. I published a cookbook. We lost a baby, or the idea of one at least, a tiny mass of cells not quite a human, but enough for that loss to rock our world. You changed jobs, got made redundant, then kick started a whole new career in pursuit of what you love best. And of course we found out about Nino’s heart, travelled through pregnancy with joy but worries aplenty, watched our little boy be born, undergo ten hours of surgery and grow into the chubby, healthy cherub he is today. The word rollercoaster springs to mind, or whirlwind, or both. In between these ups and downs and life-changing events, the one constant has been you. Your ability to keep me calm, to talk me down, to envelop everything in a big bear hug and to love beyond reason. I always knew how wonderful you were, but the true depth of your happy heart has been revealed since Nino was born. My boys. I’ve never felt more loved and couldn’t love you more. Yes, I might growl at 4am when I haven’t had enough sleep or sling bin bags in your direction on a daily basis (taking out the bins is definitely a boy job, am I right? ), but beneath the endless nappies and tired eyes, my love for our little family of three just keeps on growing. On our wedding day we ate chocolate cake and ice cream and danced the night away. 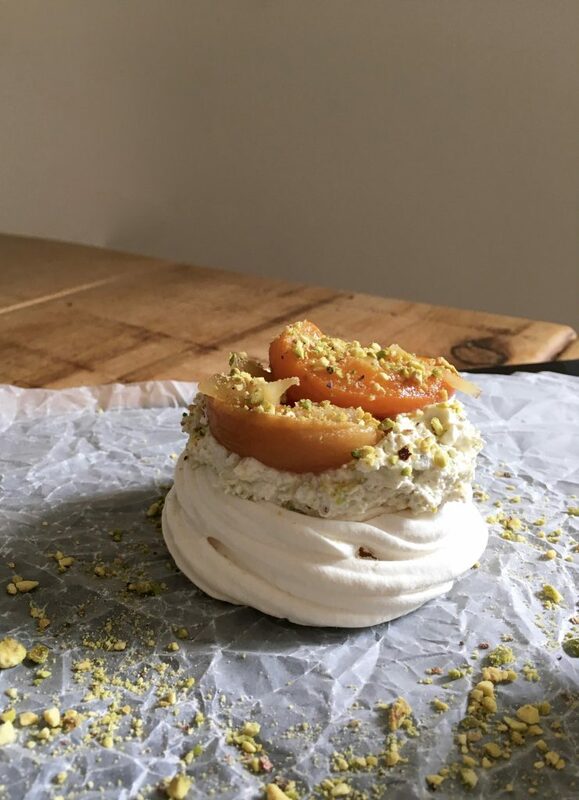 These apricot, stem ginger and pistachio meringues bear pretty much no relation but they’re zingy and bright and perfectly sweet, just like you. Happy anniversary my darling Mr. Doran, I love you infinitely. 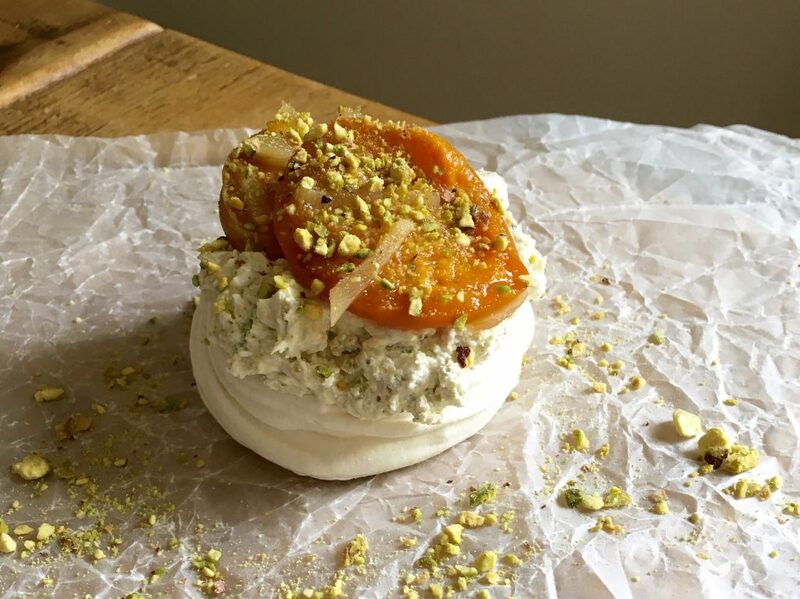 Crisp on the outside, chewy in the middle and topped with a tangy vanilla cream, softly sweet apricots and toasted pistachios, these meringues make for the perfect summer dessert. Preheat the oven to 200 degrees C. Line a baking tray with parchment paper. 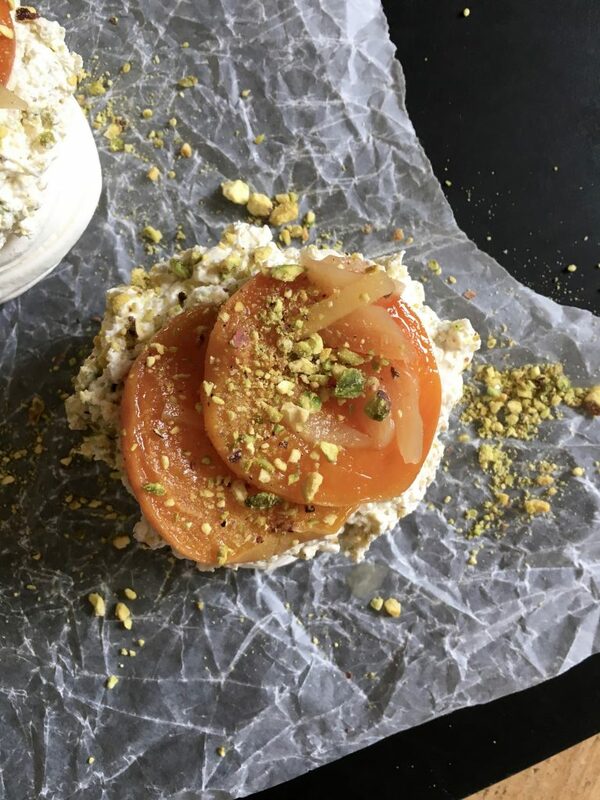 Toss together the apricots, stem ginger and syrup and roast on your prepared baking sheet for 15 minutes, or until soft but still holding their shape. Set aside to cool completely. Lower the oven temperature to 120 degrees C/100 C fan. Line two large baking trays with parchment paper. Whisk the egg whites in the bowl of a stand mixer until soft peaks form. With the whisk still running, slowly add the caster sugar, 50g at a time, and continue to whisk until smooth, thick and glossy. Sift the icing sugar over the meringue mixture and fold in. 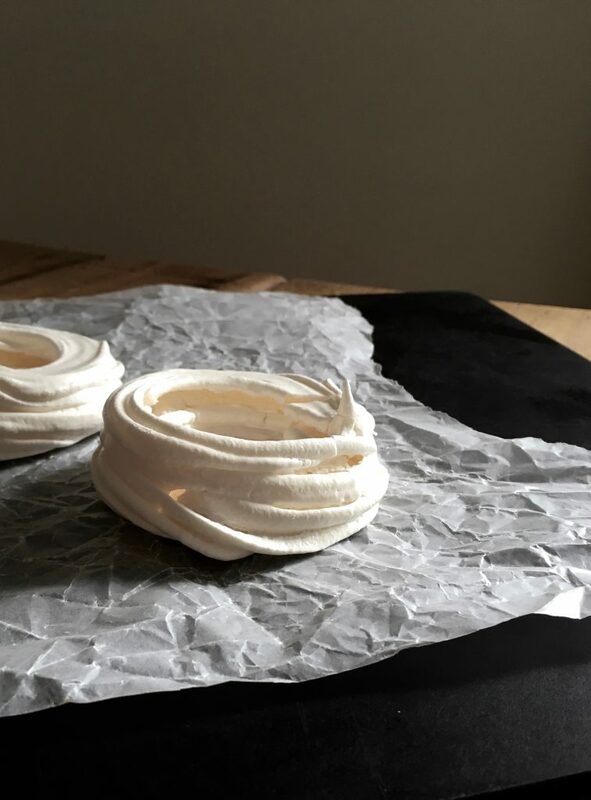 Spoon or pipe eight large meringue nests onto the prepared baking sheets and bake for 1 and ½ hours until crisp on the outside. 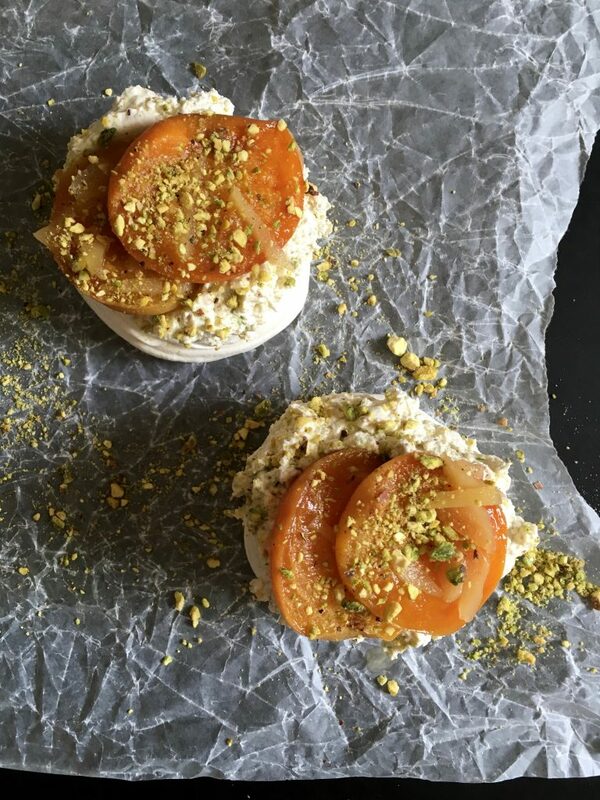 Turn the oven off and leave the meringues inside to cool completely. When ready to serve, whip the cream and vanilla extract until soft peaks form. Fold in the Greek yoghurt then divide the cream between your meringues. 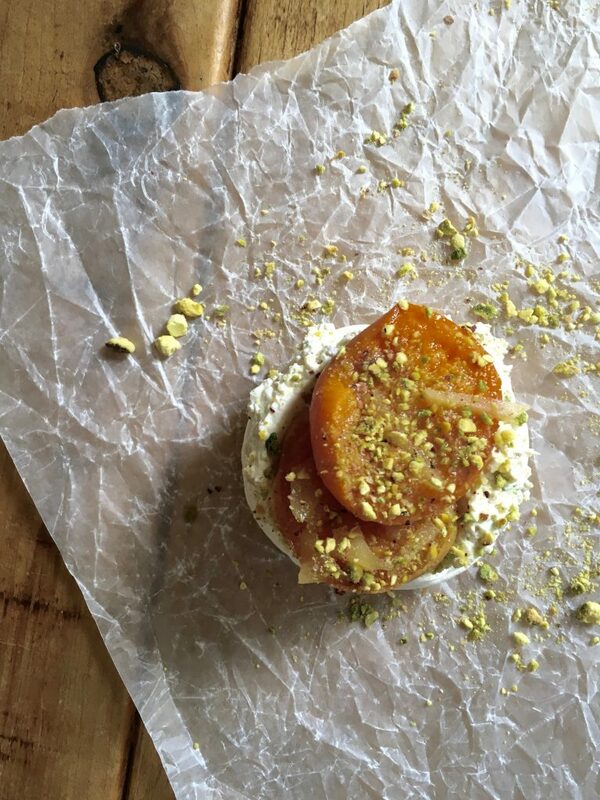 Top each meringue with two apricot halves and a sprinkle of pistachios. Serve immediately. 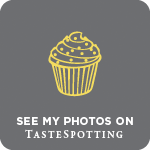 Happy anniversary – lovely blog to cheer the heart of a long and happily married lady. Yummy recipe by the look of it!